In China, the ICT sales growth rate slowed down in 2015, due to increased economic uncertainty, higher market penetration and price competition. However,it still outperformed China´s 2015 GDP growth rate. According to the Ministry of Industry and Information Technology (MIIT), total sales revenues of enterprises with annual revenues of more than CNY 20 million increased 10.4%, to CNY 15.5 trillion, after growing 13% in 2014. Sales of ICT manufacturers grew 7.6%, while sales of software and IT service providers increased 16.6%. The increase in domestic sales, which reached 17.3%, was the key driver of growth. On the other hand, the overseas market reported a sales decline of 0.1% in 2015. Despite increased economic uncertainty in China, research institute BMI still expects strong growth in 2016 as the hardware market gains further momentum and forecasts a CAGR of 8.1% for the period 2016-2020. While a hard landing remains a downside risk, income growth, enterprise modernisation, government support for the IT industry, and particularly emerging technologies such as cloud computing and the Internet of Things should drive market expansion in the medium term. 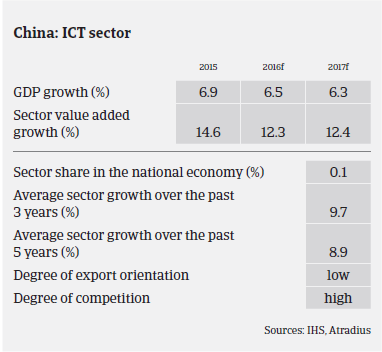 Despite the still robust growth rate of the Chinese ICT market, challenges are increasing. For ICT manufacturers, competition is getting fiercer, as a large number of mainland Chinese enterprises have entered the component manufacture industry in the past decade, causing price wars. At the same time, this segment is largely exposed to metal and oil price fluctuations. Another issue is increasing labour costs, as there have been regular and significant increases in the minimum wage payable in various provinces of China. Therefore, many ICT manufacturing facilities in China are facing difficulties when recruiting employees. In the ICT distribution/retail segment, requests to prolong payment terms and overdue payments have increased. For traditional sales channels competition from the growing online sales segment is increasing, as online sellers can offer competitive prices and convenient in home shopping, and brick-and-mortar businesses suffer from costs for logistics and warehousing. Retailers focused on selling foreign ICT brands are facing increasing downward pressure, given the Chinese government’s preference for local brands due to the national information security strategy. I.e. they may face barriers from some government-sponsored projects. 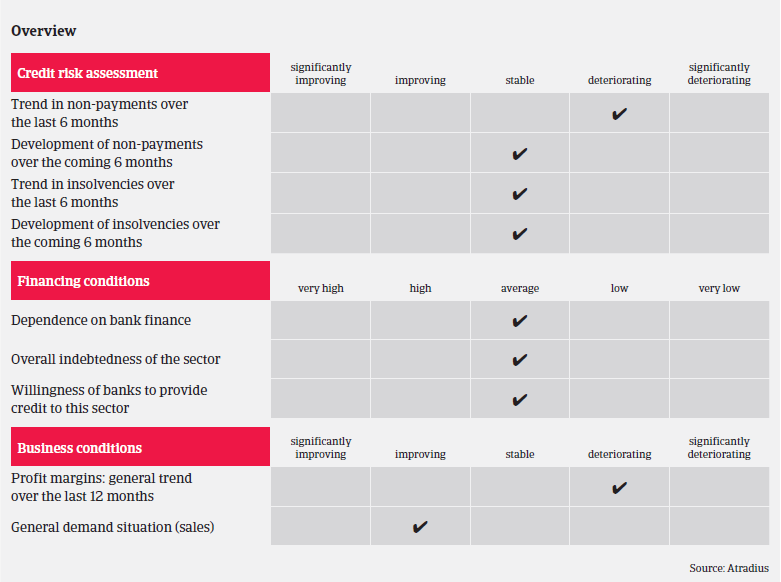 For the time being, our underwriting stance remains generally open for large ICT manufacturers and national/regional distributors, while we are more cautious with system integrators, retailers and online sellers, where competition is fierce and the financial situation of businesses is often less strong. Hardware distribution is generally a low margin sector, and therefore, businesses may invest in other fields like microcredit companies, guarantee companies, and real estate to earn quick money. This may have worked well in the past, but has become more risky now due to tight liquidity in the market and downward pressure on real estate. Cross guarantee is widely used in bank lending to ICT traders, meaning that one company’s liquidity collapse could drag down others.